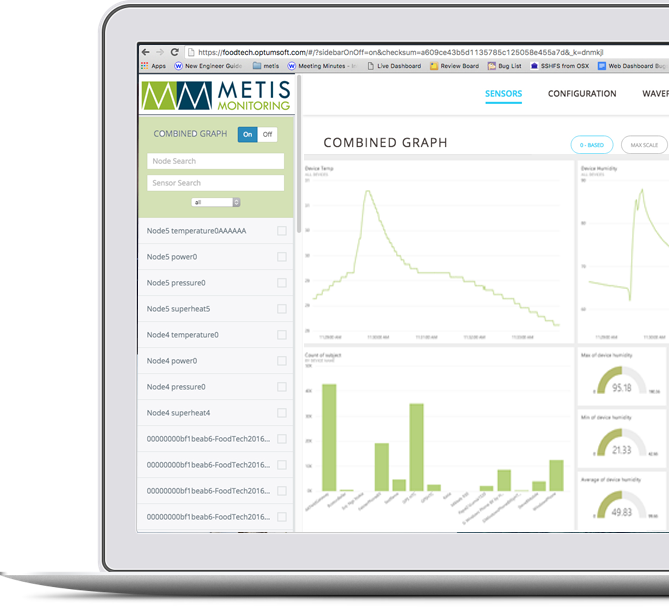 Metis Monitoring can cut cost by up to 66% per year. With Metis Monitoring costly outages are now a thing of the past! With Metis Monitoring you find leaks early – before they cause costly trouble. Now every refrigeration installation can be made smart. Move from reactive refrigeration maintenance (breakdown maintenance) to Reliability Centered Maintenance (RCM) with Metis Monitoring and cut cost by up to 66% per year. Costly outages are now a thing of the past! Metis Monitoring lets you know the moment your refrigeration system needs attention, well before expensive repairs, spoilage and waste occur. Leaks happen. And are frequently found way too late. Replacing refrigerant is costly. With Metis Monitoring you find leaks early – before they cause real trouble. In the past, only high-end refrigeration systems had any form of automated monitoring which was out of reach for most operators. Now, thanks to advances in technology, every refrigeration installation, new or existing, can now be made smart. Metis Monitoring is designed to be your on site refrigeration expert so you don’t have to be. Metis Monitoring works all the time, 24 hours a day, 7 days a week, 365 days a year. Now you will Know exactly what’s going on. Move to Reliability Centered Maintenance now! Now know exactly what’s happening. Follow temperature, refrigerant pressures, cycle times, cycle frequency and power consumption down to fans and compressors. View real-time data as well as historical trends. Gain the power, insight and peace of mind that SMART refrigeration delivers. Make certain that refrigerator door activity is kept to a minimum and that the room never is left open. Track current and historical suction superheat levels to guard against flood-backs or compressor overheating. Is a hot or cold day affecting things? Are things to dry or too wet? Metis Monitoring keeps taps on that too. Know liquid sub-cooling levels now and in the past. Keep a sharp eye out for condenser and filter-drier health. Learn when compressor or fans are working too hard or too little. Long before expensive repairs. It’s simple to get your Metis Monitoring system up and running. Any existing refrigeration system can be retro-fitted in less than a day with real time data being tracked instantly. We do a complete site-survey and then deploy a comprehensive set of cloud-enabled monitoring sensors on your refrigeration system. Gain access to real-time and historical data 24 hours a day, 7 days a week, from your smartphone, tablet or laptop – anywhere. Advanced correlation and in-depth historical analysis may reveal more serious issues. If you need extra help, our team of experts are standing by. Monthly on-call service: 24/7 expert standby, reporting, remote health checks, phone support.